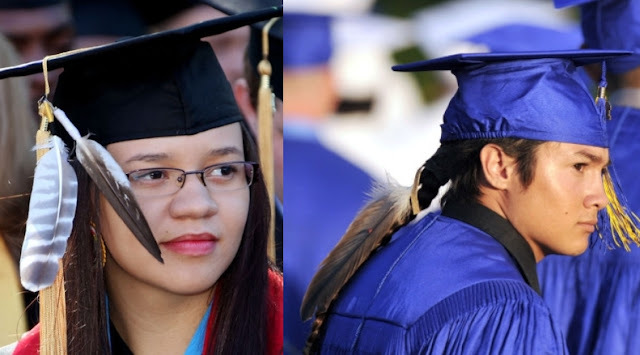 Working on behalf of American Indian students who are denied the right to wear eagle feathers or other cultural adornment on their high school graduation cap and gown, California Indian Legal Services has successfully intervened in many of these cases. In some cases, schools have reversed its denial. Additionally, California Indian Legal Services partnered with the California State University San Marcos’ Native American Indian Studies and the School of Art, Arts and Technology, to produce a short video capturing the importance of this issue for Native American students and tribes. SACRAMENTO, CA – California State Assemblymember Todd Gloria (D-San Diego) announced today the introduction of his bill, AB 233, which will finally permit students to wear religious, ceremonial, and cultural adornments during high school graduation ceremonies, a practice that has not been permitted in some school districts throughout the state. Responses to "Bill Introduced in California Legislature to Allow Eagle Feathers on Graduation Caps"
I am returning Assembly Bill 233 without my signature. This bill provides that a student has the right to wear specific adornments at school graduation ceremonies. Students in California have a well-established right to express their views through symbolic acts under the state Education Code and the Free Speech Clause of the First Amendment. See Tinker v. Des Moines Independent Community School Dist. (1969) 393 U.S. 503, 506. Under these precedents, student expression is clearly protected. To the extent that there is a dispute about what a student can wear at school graduation ceremonies, I believe those closest to the problem -- principals and democratically elected school boards -- are in the best position to make wise judgments.